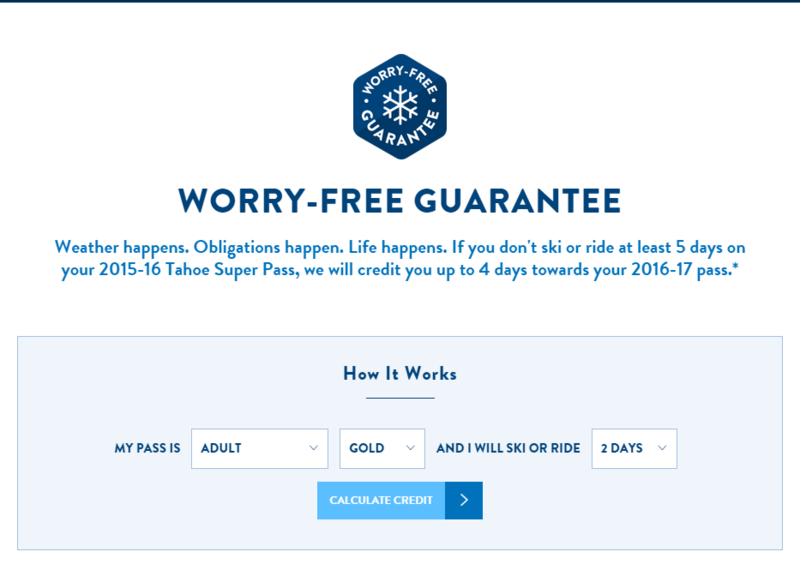 Last week Squaw Alpine launched an intriguing new season pass concept. The idea was fairly simple: if you don’t use your pass enough to be worth it one season, we’ll give you a credit toward your season pass the next. I love the way Squaw innovates off of data. 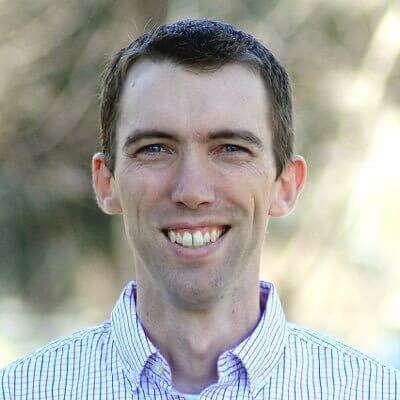 This wasn’t their first passholder-renewal-campaign rodeo, so I got in touch with the brainchild of the idea, Squaw’s business analyst Tom Feiten, for the scoop. Gregg: First, tell us a bit about yourself, Tom. Your background, experience, and how you ended up at Squaw Alpine. Tom: I started in the ski business in 1997 at Northstar-at-tahoe and worked with the Booth Creek Resorts through the full cycle of the build of the company and the subsequent divestitures of the various resorts. During that time I was lucky enough to work with some incredibly bright individuals and across a diverse set of resorts with many different strategies, goals and markets. Upon the sale of Northstar-at-Tahoe management contract to Vail Resorts I switched gears a bit and entered into a partnership with Teton Gravity Research to grow their annual movie tour. Through an innovative business model and a focus on really understanding the customer and providing a unique communication link between TGR – Tour Sponsors – Tour customers, my team and I were able to significantly increase the annual attendance and overall tour earnings and I believe make the experience available to a broader footprint of attendees and just an overall superior experience. Gregg: Many of us have read the sales copy, but in a paragraph and in your own words, how does this “Rollover Days” concept work? Tom: The roll over is intended to take the ‘angst’ out of buying a pass and, hopefully, provide a level of confidence to purchasers that they will get the most value they can out of the pass. Based on our studies (and studies provided by our industry partners) five days is the point at which most pass purchasers feel like they have made a good purchase decision and hence likely to be positive about the pass program. By back stopping them at this number of days we believe we will get overall more satisfied customers, more renewal and more new customers. Basically, our belief is that this concept represents a natural progression within precommitted products that truly is a win-win for customer and business. Gregg: Talk a bit more about why you chose a “rollover” concept instead of just a refund that other skiers have pressured resorts to provide after this tough season? And, more specifically, why you chose to start this program going from 15/16 to 16/17 instead of 14/15 to 15/16? Tom: Interestingly, our research indicates that a refund isn’t what most passholders are really interested in when deciding to renew, at least not in amounts that are economically viable. The roll over is potentially part of a much longer term strategy, assuming the customer reacts positively to it. And that is really why we started this for 15/16, this isn’t a one-off refund program, but rather a product development program aimed at addressing feedback we were receiving from our customers and trying to continually push for more value. Also, with a refund program you are only impacting one segment of your potential market/customer base, we wanted something much more broad. Gregg: Squaw has now shown us two ways to work on that 5-day mark. The first is what they did a couple years ago to incentivize 1-4 day-ers to come back and get over the mark. Is the rollover idea being used in tandem or has this replaced that approach? And why? Tom: Based on how the winter shapes up next year, I think that low usage incentive is always on the table as one tactic in an overall strategy of getting our passholders to ski more. In some ways it is an even more important tactic for usage given the roll over guarantee. Gregg: A reaction I’ve seen from some marketers is that they’re worried this will encourage more people to ski less instead of more. I’ve definitely felt that same concern as well. Any thoughts on that? 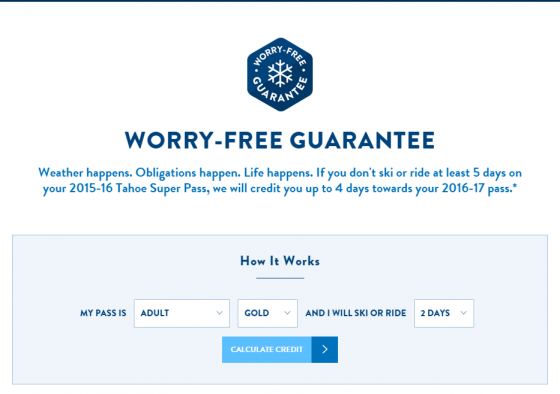 Tom: I am not concerned at all about the idea that someone would ski less due to the worry free guarantee. In fact, if a customer decides to bank their ski day to apply against the following season, I feel great as I just locked in a low usage renewal, one of the primary goals of the program.